Are you one of those patients who only floss the night before their dental appointment and maybe the morning of? Does your stomach do a few flips when your New Berlin dentist asks how often you floss? We hope not (Yes, we can tell the difference between a diligent brusher and someone who brushes and flosses)! The teeth and gums don’t lie. If you’re one of the many patients that need to improve their dental regimen at home, this post is for you! Why is flossing your teeth so important? Well, let’s explore what happens when you don’t floss. That way you can determine which is easier to deal with: the consequences of skipping a simple step of your dental routine or flossing just once a day. 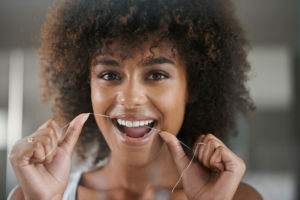 When you choose not to floss, you put yourself at risk for two major dental issues in your mouth: gum disease and cavities between your teeth. Without flossing, you are not able to remove dental plaque buildup, leftover food particles, or other dental debris. According to Clinical Microbiology Reviews, there are over 1,000 bacteria in dental plaque! These bacteria can irritate and inflame the gum tissue, causing it to become red, swollen, and susceptible to bleeding. It can become a vicious cycle because the bleeding breeds more bacteria and raises the risks of quickly developing gum disease. As if those two health risks aren’t scary enough, here are 5 more reasons that will make you think twice about skipping a major part of your dental routine. Flossing and brushing are more effective than brushing alone. The soft bristles on your toothbrush work to remove the sticky plaque that’s on the surfaces of your teeth. But what about the many crevices between them? As a matter of fact, you miss cleaning 35% of your smiles surfaces if you skip flossing! Your gums protect the base of your teeth, where connective tissue attaches to your teeth’s roots and the bones that keep your jaw strong. Pockets of dental bacteria and debris can form if you neglect your gum health. If left untreated, the bacteria will spread below the gum line into the connective tissue, causing periodontal disease (advanced gum disease) and eventually tooth loss. Research has shown that the bacteria created in the mouth can spread to other parts of the body through your inflamed and receding gums. This can lead to heart disease and diabetes, and even strokes. Flossing daily will help keep the bacteria at bay, keeping your mouth and body healthy. Flossing helps banish bad breath. Flossing daily removes the food particles and bacteria that cause bad breath. This makes flossing one of the easiest ways to prevent bad breath. Flossing, along with regular dental exams and cleanings, is an important part of preventive dental care and reduces the likelihood you’ll need expensive dental procedures in the future. Your Dentist Can Tell Who Flosses and Who Doesn’t! If being caught in a white lie isn’t embarrassing enough, hopefully, these reasons have convinced you to change your philosophy on flossing. Remember, Your New Berlin dentist at Elmbrook Family Dental is here to help you, not scold you for less than perfect flossing habits. If you need assistance getting your dental hygiene back on track, give our office a call.